Roll down to the end of the page to interact with the simulator and self-assessment for calculation: Deviation and tolerance. 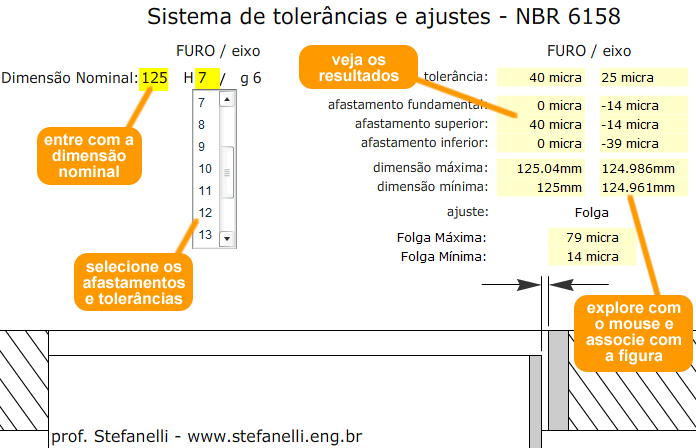 It provides the maximum and minumum dimensions of the hole and of the shaft, using the standard ABNT NBR 6158 (Brazilian standard based on ISO / DIS 286-1 and ISO / DIS 286-2), it also calculates the deviations, the tolerances and the adjustment, besides presenting a representation with no scale of adjustment of the shaft and hole. Take a look at the image below, and how easy it is to use. Just input the nominal dimension and select the deviation and the tolerance of shaft and hole. Automatically, the simulator will provide the tolerance, the deviations, and the maximum and minimum dimensions of the adjustment and spaces and (or) the minimum and maximum interferences.